Rep. Tim Quinn, R-Heber City, speaks during a town hall at the Park City Library on Thursday about gun violence. The event was organized by students at Park City High School. Almost everyone in the country can agree that gun violence has no place in schools. What they cannot agree on is how to reduce it. 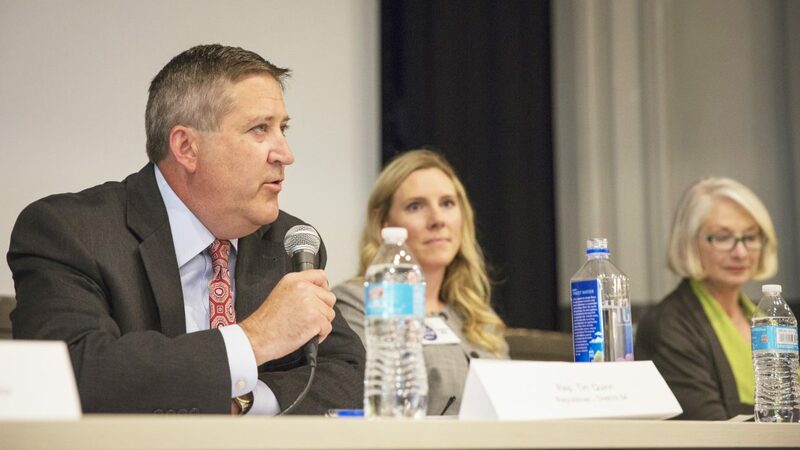 At a town hall meeting on Thursday, a few dozen adults and teens gathered at the Park City Library to hear the proposed solutions of candidates running for seats in the Utah Legislature. The debate grew heated as community members on both sides of the issue stood up to ask questions while candidates insisted that gun violence is a complex issue that cannot be tackled with a single solution. The meeting drew almost as many high school students as adults, which was partly because it was organized by three students from Park City High School, Faith Staley, Adam Herbst and Adam Hickey. Many of the attendees came to hear the candidates’ opinion to help them determine who to vote for in the upcoming primary elections. There was a broad range of opinions from both community members and candidates. Rep. Logan Wilde, R-Croydon, who is running for re-election in House District 53, and Rep. Tim Quinn, R-Heber City, who is running for re-election in House District 54, were generally against the idea of increasing gun regulations. Wilde said instead that lawmakers and citizens should focus on addressing mental health in schools. Pat Vaughn, a Democrat running for state Senate District 26, and Meaghan Miller, a Democrat running for House District 54, also had differing views. Vaughn supported stricter regulations on the purchase of guns, including the possibility of a registry of those who own guns. Miller, who said she is a gun owner, stressed the importance of responsible gun ownership and the need to enforce laws against those who are not being responsible. Students also proposed solutions, such as a psychological exam for people purchasing guns, while other community members stood up to say that they think stricter laws would not make a difference. Morgan Cox, who lives in Francis, asked candidates if they would be in favor of legislation to protect gun manufacturers from legal repercussions if their guns were used to kill someone. He came to the meeting because he has seen the protests at schools across the country to demand stricter gun laws. He has a different opinion. He said that there are many laws in place and that more laws would not solve the problem. The mix of opinions is exactly what student organizers Staley, Herbst and Hickey hoped to see because they wanted everyone to hear the others’ views. Herbst said that he was happy to hear so many different questions being asked by community members, specifically his peers. Rosie Milligan, who has children in high school, said that she was surprised that everyone was able to stay relatively respectful because people are so passionate about gun reform on both sides. Whenever she sees a shooting reported in the news, she said that she wonders if it is going to happen in Park City next. “I want to hear where everybody is at,” she said. She came with her daughters Izzy Milligan, a sophomore at Park City High, and Maia Milligan, who is in college. They said that they often debate the topic at home and wanted to hear different viewpoints, which they felt like they were able to do.